Adolescents are often exposed to negative social judgments. This can create stress when they feel they cannot meet the expectations of a social situation. Yeager et al. (2016) studied whether adolescents would be able to better deal with these challenges when they were taught that people have the potential to learn the required social characteristics. In other words, when they were taught a growth mindset with respect to personality. In study 1 60 high school students participated in an experiment. They were assigned randomly assigned to the experimental condition in which they received the growth mindset intervention or to the control group in which they would not. Both groups then were presented a socially stressful task. The high school students in the growth mindset condition performed better a showed both a better self-reported stress response and a better physiological stress response. 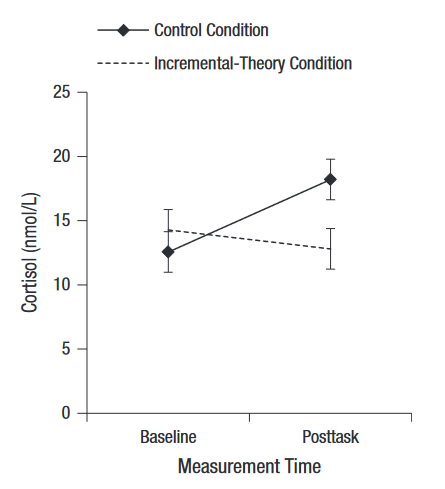 In study 2 (N = 205) the stress response of high school students was analyzed using a daily diary study. 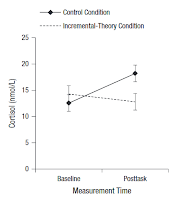 With students who had received the growth mindset intervention there was no effect of the intensity of daily stressors on their self-reports and their neuroendocrine responses. Also, they got higher grades in their freshman year. This study (as is this one) is again an indication that it can be very useful to teach high school students a growth mindset.